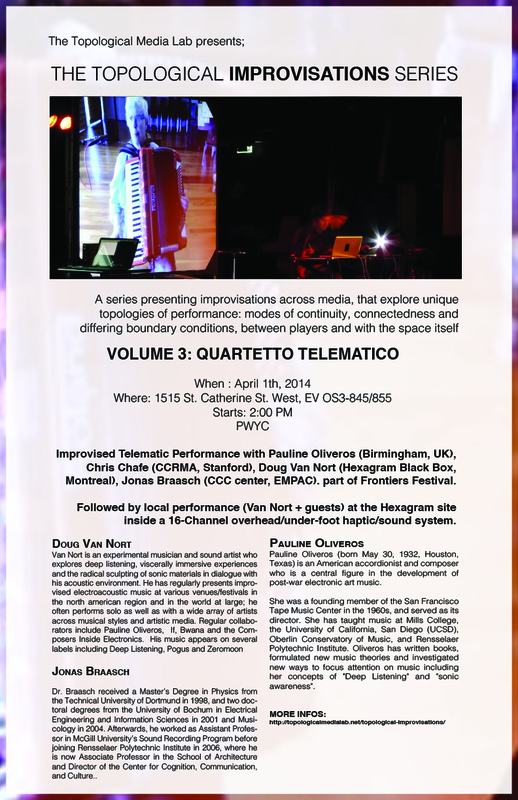 Improvised Telematic Performance with Pauline Oliveros (Birmingham, UK), Chris Chafe (CCRMA, Stanford), Doug Van Nort (Hexagram Black Box, Montreal), Jonas Braasch (CCC center, EMPAC). part of Frontiers Festival. Followed by local performance (Van Nort + guests) at the Hexagram site inside a 16-Channel overhead/under-foot haptic/sound system. Dr. Braasch received a Master’s Degree in Physics from the Technical University of Dortmund in 1998, and two doctoral degrees from the University of Bochum in Electrical Engineering and Information Sciences in 2001 and Musicology in 2004. Afterwards, he worked as Assistant Professor in McGill University’s Sound Recording Program before joining Rensselaer Polytechnic Institute in 2006, where he is now Associate Professor in the School of Architecture and Director of the Center for Cognition, Communication, and Culture. Pauline Oliveros (born May 30, 1932, Houston, Texas) is an American accordionist and composer who is a central figure in the development of post-war electronic art music. She was a founding member of the San Francisco Tape Music Center in the 1960s, and served as its director. She has taught music at Mills College, the University of California, San Diego (UCSD), Oberlin Conservatory of Music, and Rensselaer Polytechnic Institute. Oliveros has written books, formulated new music theories and investigated new ways to focus attention on music including her concepts of “Deep Listening” and “sonic awareness”.